REDEVELOPMENT 184 • SHOPPING CENTER BUSINESS • May 2018 ping center — renamed The Shoppes at Knollwood — is now better positioned to help its tenants thrive, with more parking, better pedestrian routes, improved light- ing, outdoor seating and art. REDEVELOPMENT IN A LIVE ENVIRONMENT Perhaps the biggest challenge of all in retail redevelopment projects is the need to keep stores operational throughout the process. "How to do the work" then becomes the focus. It's extremely import- ant that the customer experience remains positive during construction. That means maintaining access to mall entrances, retail spaces and loading docks during construction. Graycor has developed a unique Live Environment approach to execute the construction process while minimizing the impact on facilities, their employees and customers. Live Environment antici- pates and avoids disruption in planning, scheduling and executing the work effi- ciently, including protocols for materials delivery and on-site storage, hot-work and shut-down requirements, jobsite security and safety, temporary signage, noise re- strictions and dust management. The Live Environment work method- ology has been successfully applied to shopping centers across the country for major owners like Simon Property Group, GGP, Westfield, Rouse Properties and Starwood Retail Partners. 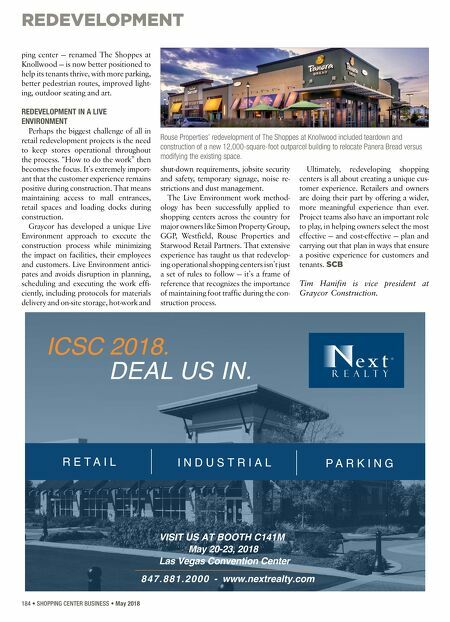 That extensive experience has taught us that redevelop- ing operational shopping centers isn't just a set of rules to follow — it's a frame of reference that recognizes the importance of maintaining foot traffic during the con- struction process. 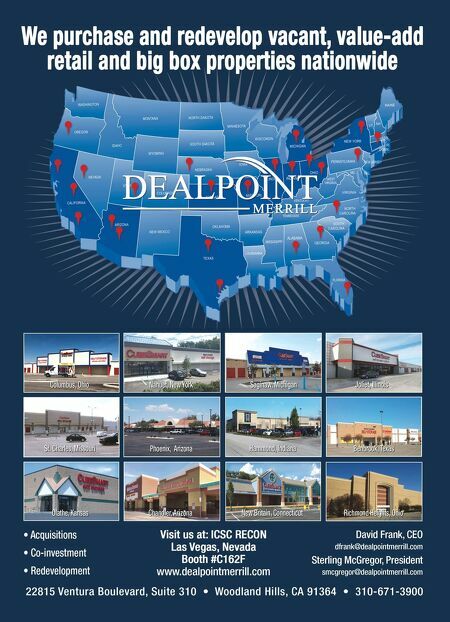 Ultimately, redeveloping shopping centers is all about creating a unique cus- tomer experience. Retailers and owners are doing their part by offering a wider, more meaningful experience than ever. Project teams also have an important role to play, in helping owners select the most effective — and cost-effective — plan and carrying out that plan in ways that ensure a positive experience for customers and tenants. SCB Tim Hanifin is vice president at Graycor Construction. Rouse Properties' redevelopment of The Shoppes at Knollwood included teardown and construction of a new 12,000-square-foot outparcel building to relocate Panera Bread versus modifying the existing space.